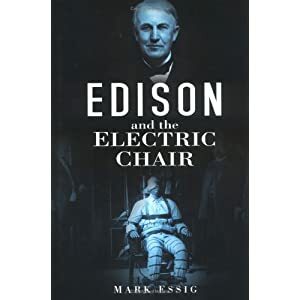 In a fascinating combination of science and history, Edison and the Electric Chair reveals a fast-paced account of how the electric chair came to be with the help of the brilliant inventor Thomas Edison. While some may find the specter of death to be the most alluring aspect of this book going in, it is much rather Edison himself whom we find ourselves very much wanting to learn more about. He’s a man of child-like curiosity and endless enthusiasm, clever from the very start. The book recounts a story of his early days in the telegraph business, when some men at a new job tried to haze him by sending over messages they hoped would be far too quick to translate. Edison couldn’t be tripped up, and when the correspondent on the other end started going so quickly he made mistakes, Edison replied “You seem tired, suppose you send a while with your other foot.” From then on, he was fully accepted into the group. But apart from being a lively, ebullient man of science, Edison was also incredibly intriguing. He was fiercely competitive, and even devious. He was strongly against capital punishment, and yet he did what he could to push electrocution as a humane new method of execution in order not only to ease the sufferings of the condemned, who until then had been hanged, but to discredit his competition, Westinghouse Electric. This web of intrigue and legal battles form the heart of the book and leave us wondering even more who exactly Edison was and what made him tick. Most of all, throughout the descriptions of his huge array of inventions, I was left wondering what exactly he would think of the technology of the world today. What would the man who invented the light bulb and the electric typewriter think about computers, for instance? This book could easily serve as a gateway to a full blown fascination for all things Edison. For those of you far less scientifically-minded, the details of how dynamos, transformers, and voltages work might prove to be a little on the dry side. And they are extremely detailed, though thankfully keeping in mind that very few readers are electricians and going to have an ingrained understanding of them. I suspect it may also serve as a gateway in this sense in encouraging some readers to start dabbling more in science books, and if I had a better grasp of these things, and not such a strong disposition towards history above all else, I may be one of these people. In fact I’m sure a great deal of you will find these sections to be altogether delightful. Those who pick up the book based on their taste for the macabre won’t be disappointed when the fatal moment arrives. The account of the first execution by the electric chair is riveting. Large undertakings such as these rarely work the very first time, and the results can be gruesome. I won’t say any more about this and ruin it for you, it’s arguably the best part of the book. One thing I personally found missing was Edison’s relationship with Nikola Tesla. I know almost nothing about the man, but knowing at the very least that he existed and that there was a rivalry between them made me curious to know more, especially since each inventor has quite a following with very strong feelings against the other. This omission to me is glaring, but I suppose will have to remain a subject for another book. I wonder if others will feel the same way. It seems to contribute to the book somewhat going out with a fizzle instead of a bang, offering just one teasing glimpse to remind us that there might be more to the story than we were given. So Thomas Edison, against capital punishment, encouraged the electric chair as a form of execution. In this way he professed to save lives as it would warn the world about the dangers of alternating current and therefor cripple Westinghouse electric. It didn’t work, and instead of being a step towards the abolition of capital punishment, the new method only encouraged it because of its relative humanity, and America’s culture of fondness for all things new and improved propelled it on a different course than the rest of the Western world. It is exactly as the title says, a story of light and death.